Clear-View Fiction Editing: What Makes You A Writer? Are you a #writer? What defines you as such? Is it that you have a qualification from a college, online or real-life? Are you well published, traditionally or self? Do you just dabble, popping out the odd poem or short story as the mood takes you, or are you a fully-committed career scribe, chipping away through hard time at piece after piece, with deadlines looming over your shoulder? Do you have the discipline and the desire to stick with it? To plough through the frustrations of day in - day out work, work, work? Do you care that the best editors, agents, and publishers aren’t queuing outside your door, scrambling to sign you up? Are you willing to fight through such crap, keep on writing, and persevere even though there’s no real likelihood of you being ‘discovered’ in this lifetime? 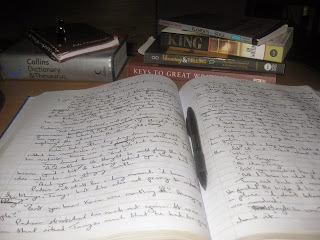 What makes me a writer is the fact that I write on a regular basis and that I stick to it with passion and fervor. I work to hone my skills by reading the best writing and by writing. I also have intuition and I analyse situations. I believe writers are supposed to do this. Writers are artists and they see what ordinary people fail to see. Writers are compelled to be creative. Writers are in love with words and if they don't write they feel incomplete. So I feel I'm a writer. I love your answer, Julia. It's that absolute love of words, plus that passion for the creative, that keeps me enthralled with and embedded in the whole process. Thanks so much for responding. E.
I echo what Julia says: a passion for words is a damn good start and constant learning and striving for improvement is vital.